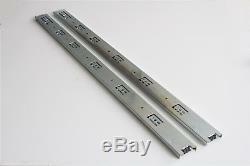 Quantity: 1 pairs for 1 drawers Length: 28" Width: 1.75" (45mm) Thickness: 0.5" (12mm) Load Rate: 100-lb Extension: 3-fold full extension ball bearing Mounting Type: Side-mounted Minimum Side Space: 0.5" on each side of the drawer Material: Cold rolled steel 1.2mm x 1.2mm x 1.5mm Color: Zinc plated. Screws: Not included (#4 flat philips recommended). 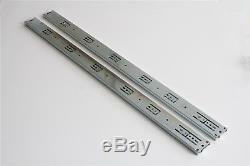 Package Content : 1 Pair 28 Full Extension 100-lb Ball Bearing Drawer Slide. 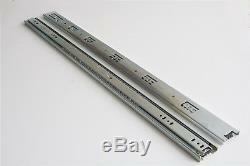 The item "28 Full Extension 100-lb Ball Bearing Drawer Slide 700mm45mm12mm 1 Pair" is in sale since Tuesday, August 14, 2018. 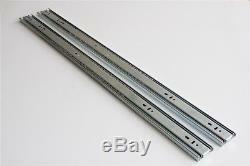 This item is in the category "Home, Furniture & DIY\DIY Materials\Cabinets & Cabinet Hardware\Drawer Runners".